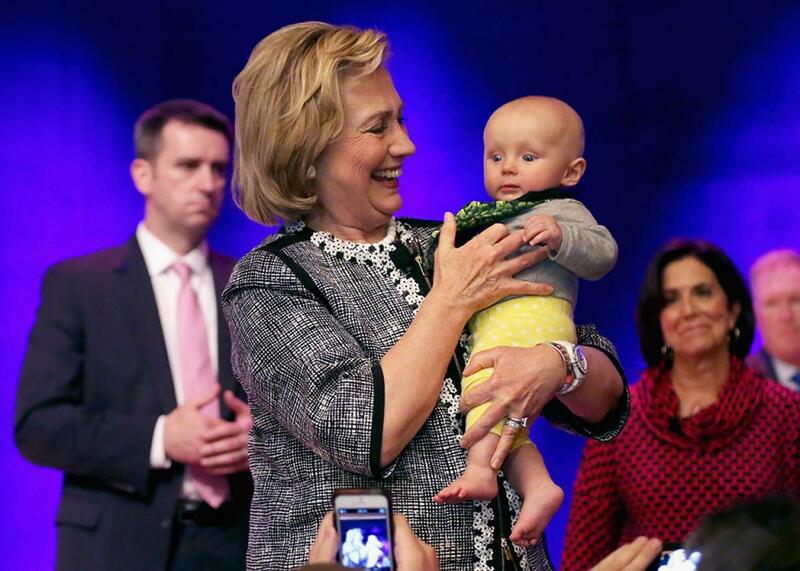 Hillary Clinton’s plan for paid family leave is bad policy design. If only the ghost of FDR were on her advisory team. Hillary Clinton holds an audience member’s baby after discussing her book Hard Choices: A Memoir at the Lisner Auditorium in Washington, D.C., on July 13, 2014. Paid family leave has created a schism in the Democratic Party. True, all of the party’s candidates have outspokenly backed the idea that the U.S. should catch up to the rest of the world and guarantee its citizens paid time off for a new child or a serious injury. But Hillary Clinton has broken with her rivals by not endorsing the proposal pending in Congress. For a long time Clinton hadn’t said what she would do instead. Now the details are finally out, and in many ways her proposal is nearly identical to the other Democrats’: She wants to ensure that when Americans take 12 weeks off through the Family and Medical Leave Act—a current guarantee of unpaid leave—they will get at least two-thirds of their normal pay up to an unnamed cap. But there is one key difference, and while it might sound trivial to new parents desperate to afford some time off, it could make or break the future of paid leave in the U.S. That difference: how exactly to pay for the benefits. The proposal in Congress would do it by creating a social insurance program akin to Social Security. The bill would levy a new payroll tax—0.2 percent, or about $1.50 a week—on both employees and their employers to fill up the fund, and then the fund would pay out benefits to everyone eligible to receive them when they wanted to take family leave. Clinton’s problem with this model is that, technically, backing it would bar her from making a promise she’s gotten very keen on making: that she won’t increase taxes, not by one cent, on people who make $250,000 a year or less. “Hillary strongly believes that middle-class families deserve a raise, not a tax increase,” her paid leave proposal states. Instead, Clinton would come up with the money by taxing the rich. “She’ll ensure that the plan is fully paid for by a combination of tax reforms impacting the most fortunate,” the statement reads. Beyond the question of whether there is really enough money in that pot to fund not just paid family leave but all of Clinton’s other policy proposals as well—like universal preschool, infrastructure repairs, college affordability, and more—there is another important question: Is this how we should design such a crucial program? If the U.S. adopted her model, it would still be an outlier among most countries in this policy area. Ten other nations publicly fund paid leave benefits using government revenue, such as new tax revenue from the wealthy, to pay out income replacement. But by far the most common model is social insurance, adopted by 139 countries. There are good reasons for that. When paid family leave relies on general tax revenue, it depends on a code that can be changed at any time and is subject to the whims of budget battles—battles that happen with greater and greater frequency in the U.S. Paid leave would be on an unstable footing from the get-go. Social insurance is a different story—talk of changing up Social Security, for instance, has become a third rail. That’s because social insurance programs like Social Security and Medicare give beneficiaries a sense of ownership over the benefits they receive. Remember the people telling lawmakers to “keep your government hands off my Medicare?” These programs carry far less stigma because they are seen as something earned. People work and pay in, which makes them feel comfortable drawing on a benefit when the time comes. Even devout Tea Partiers against any new government programs tell social scientists that Social Security and Medicare are worth the cost to taxpayers. We put those pay roll contributions there so as to give the contributors a legal, moral, and political right to collect their pensions and their unemployment benefits. With those taxes in there, no damn politician can ever scrap my social security program. Those taxes aren’t a matter of economics, they’re straight politics. But Clinton’s formulation turns paid family leave into just another entitlement that one group supposedly funds for another. That makes it all too easy for opponents of paid family leave to divide the public into “takers” and “makers” (to borrow Paul Ryan’s famous formulation), insisting that too many people taking paid leave somehow haven’t earned it. There’s another messaging problem with only asking the wealthy to pony up: It plays into the idea that paid family leave is a niche benefit, not something that benefits us all and that we should all shoulder. It’s particularly troubling that Clinton won’t call on employers to help out at all. One of her bullet points crows, “Hillary’s plan will not impose additional costs on businesses, including small businesses. There is no business or employee mandate to pay for leave, nor is there a payroll tax to pay for it.” That’s a strange decision, because employers will see some of the biggest returns on an increased ability for people to take time off to be with their families when a new child arrives or a member falls ill. Paid leave has been found to increase employee retention, keep people in the labor force, and help expand it. The effect is particularly strong with women. This may all sound like a small fight to pick, given that among the candidates on the Republican side of the aisle, just one—Marco Rubio—has come out in support of paid leave, and even his proposal would do little to guarantee Americans universal coverage. Many of the others have said the government should do nothing about paid leave. But policy design matters, particularly if supporters want to see paid family leave come to fruition and survive in a political climate that’s hostile to new government benefits. Employers should have some skin in the game. So should everyone. Raising children is a public good. It creates and molds our future citizens, voters, workers, taxpayers. It shouldn’t just be on the wealthy to make it a bit easier. It’s on all of us.